Laser Shot’s Vehicular Convoy & Gunnery Trainer consists of an immersive training environment that places trainees in high fidelity virtual environments in order to train effectively on a variety of crew level operational tasks, such as Counter-IED training and extremely realistic mounted and dismounted gunnery training. 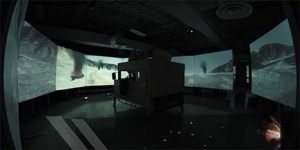 The advanced training courseware of Virtual Battlespace 3’s Tactical Weapon Simulator (VBS3-TWS), combine with exclusive laser-based individual and crew-served training weapons, enable Laser Shot to deliver the most realistic and immersive conditions possible in a training environment. 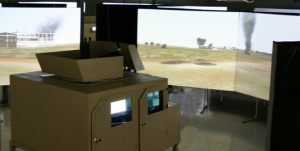 When combined with pre-mission planning and rehearsal, on VBS3 desktop applications, and/or geo-specific terrain scenarios, the Laser Shot system provides the military customer high quality, cost-effective training. Currently used at the Warrior Skills Training Centers at Ft. Hood, Ft. Carson, and Ft. Riley. Prepares Soldiers for deployment through state-of-the-art geo-typical and geo-specific virtual environments in VBS3. Increase gunner proficiency and reduce ammunition budgets with the use of high-fidelity simulated recoil weapons. Available with realistic vehicle mock-ups of the most current and common military vehicles.